I have been thinking hard, trying to see the point of view of those who see ongoing horse care as a rather trifling matter. Those who don’t care for their animals to the degree that they should maybe have a rationale for their actions. This seems contradictory since the word rationale implies “well thought out.” And quite obviously, those who neglect their animals aren’t following a line of logical thought. meaning, that these animals don’t need as much care as many of us believe. Had he been questioned, he may have given the timeworn example, which is horses seem to do just fine in the wild. This rationale is actually what’s prompted many in New York City to argue that the Central Park carriage horses be banned. These people contend (and are using the argument) that horses do best on large expanses of pasturage. The implication is that they need minimal care. This is a wrongheaded assumption. All horses, year around, need ongoing access to hay, water, and shelter. This particularly holds true of horses in the winter—especially in the winter in Alaska. Also, there are no vast acreages for Alaskan horses to roam around on. Much of what is here consists of areas that are inaccessible; mountain, tundra, and wetland areas included. I cannot speak knowledgeably about wild horses, and what they have to contend with, but I suspect that their conditions are less than ideal. They no longer have vast areas to roam around in. And year around weather conditions are more variable than they used to be, which I’m sure is causing health-related issues. However, I don’t advocate that they be rounded up and removed from their environs. But I’d like to think that the BLM or other governing bodies will watch out for these animals, and if need be, provide them basic health care. The carriage horses. What those wanting their removal realize is that these animals are not wild horses incognito. Rather, they’re domesticated animals who have been trained to do a specialized and often difficult task. It takes years of training in order for them to do what’s required. They (like police horses) must learn to stand quietly for hours on end and to ignore external distractions. They must also travel a set route and remain calm when traversing that route. It’s a huge endeavor, one requiring a great deal of patience and expertise on the part of drivers, grooms, handlers. The horses that succeed in this endeavor have a certain mind-set. I know this from experience. We thought that Tinni would be a good cart horse, but he clearly didn’t like this. Mr. Siggi took to it readily. We’ve had Signy in harness but have not yet hitched her to a cart. She’s going to do well because she’s very grounded. The jury is out on Raudi. I want to wait until I have considerably more driving experience before I cart train her. 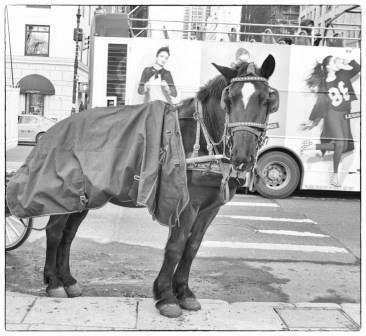 Undoubtedly, the New York City carriage horses will be rehomed. I hope that each and every one of them ends up in the hands of a caring horseperson. The best of all worlds would be if they can continue to pull carts. Back to the situation in our midst. Pete once said that horses need to be protected from themselves. This is so true. They are paradoxical in that they’re so physically strong and yet at the same time so physically fragile. As I’ve said repeatedly, horses do best when they’re provided with the essentials – food, water, shelter, veterinary care, farrier work, exercise, manure management. Food – good hay in the winter. Hay acts as heating fuel; it keeps the horse warm and the gut moving. Lack of gut motility can result in colic, an impaction, and this can lead to death. Water—in the winter should be warm. If warm, the horse is more inclined to drink. Shelter –protection from the elements decreases energy requirements markedly. Veterinary care—an ounce of prevention is worth a pound of cure. Exercise—this (as it does with humans) keeps horses physically and mentally fit. One of life’s greatest unfairnesses is (in the spring) putting a saddle on a horse that has had little exercise and expecting it to again do as expected. Farrier work—misshapen hooves can result in many painful and life-threatening ailments. I could elaborate further on each and every one of the above essentials, but I won’t. Most importantly, those owning horses need to be open to learning as much as they can about their care; otherwise, the horses might suffer the consequences. I am now heading out to spend time with my animals, and making sure that their needs are being met. Yep, this is a time-consuming endeavor. I took on this job knowing it would be this way. But I would not have it any other way. As Pete often says, I have the gene.